Optimize your blogging (and browsing!) experience with these useful and often time-saving Google Chrome extensions. “+1” is short for “you should check this out” or “I think this is really cool so you would too!” With this extension you can help your friends, contacts and other random web browsers see which articles are worth checking out. Bonus: You can start a conversation, comment and share articles. Bonus: Post to blogs from WordPress, Blogger, TypePad, Windows Live Spaces, or any other platform that supports the MetaWeblog or MovableType APIs. 1. Shortens: There’s nothing worse than a link that runs on and on. Make your links beautiful by running them through this extension. 2. Measures: Bit.ly collects data so that you can track who shared and/or clicked your shortened links. 3. Optimizes: Easily share your links via emails, Facebook, and Twitter. Get the scoop on your contacts. With Rapportive you can see their picture, location, what they do, and who they are. You sleep soundly while Boomerang sends your pre-scheduled emails, even if you’re offline! Available for Android devices as well. Bonus: Boomerang tracks your emails so you can see who has and hasn’t read your messages. Receive notifications, open, read, and delete your emails without opening your Gmail account. Bonus: Manage multiple accounts with Checker. 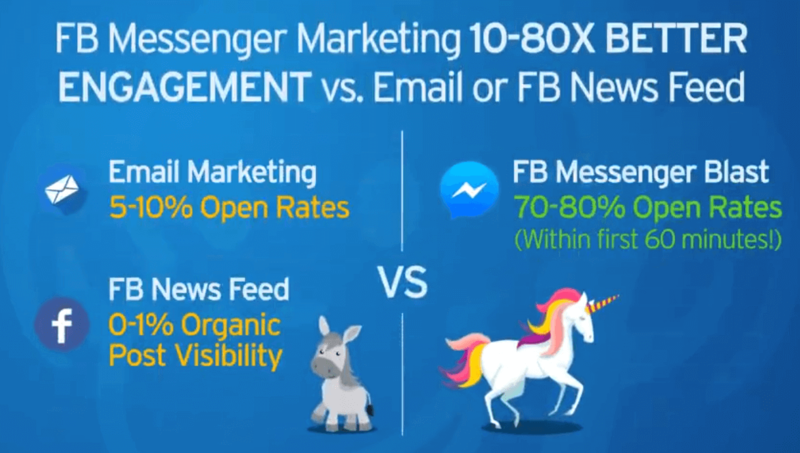 “Buffer” the time between your Twitter, Facebook, Google+, and LinkedIn posts by adding them to your queue so that you can optimize for reader engagement. Bonus: Receive analytics on shares, likes, re-tweets, mentions, and more! Double Bonus: Instantly share the webpage that you are on by clicking the Buffer icon. Sitting at your desk all day is not only bad for your health; it’s also bad for ﻿﻿productivity! This extension reminds you when it’s time to take stretch your legs and take a break. Bonus: If you’re feeling inspired and don’t need a break just yet, there is an option to skip the break or postpone it until later. Just want the main idea of an article? Shorten summarizes the main points with just the click of a button. Bonus: You can control how much you want the article to be shortened. Double Bonus: This extension also blocks ads. We’ve all been there; you’re in the middle of filling out a tedious form and then all of the sudden, CRASH! Install this extension and everything you’ve typed into a form will stay saved. WiseStamp lets you create a dynamic email signature. Add all your social networks to your signature and start spreading the word about your blog! Manage the videos uploaded by your favorite YouTubers with Video Deck. Remember: You must have a YouTube account to use this extension. Bonus: Take advantage of Video Decks many features including being able to mark your favourite videos, add playlists, share videos, rate videos and much more. Having trouble coming up with an appropriate email? Crystal analyzes the profiles of online personalities to help you determine what they would and wouldn’t want to see in an email. Improve your communication with Ginger, an extension that checks your grammar and spelling. Use it for your online writing, business correspondence, academic documents, social writing and more. Alternatives: After the Deadline or Spell Checker for Chrome. This extension allows you to create temporary email addresses so that you can protect yourself from spam when you register accounts on the Internet. Gmelius makes it simple for you to customize the look and feel of your Gmail account. Bonus: There are added features that allow you to detect and block email-tracking attempts, block Google Ads, schedule emails to send later, and much more. Pushbullet links all your communication tools together on your computer. Whether it’s SMS or Whatsapp you can communicate, receive notifications, and share files easily through one device. Without the downloading steps that typically come with storing files on the cloud, Ballloon is the fastest and easiest way to save your files. Get rid of clutter by using this extension to block annoying ads, malware, and tracking. Not only does it make browsing easier but it also decreases loading times! Bonus: this extension blocks ALL ads. Double Bonus: Over 50 million people use this extension! Check the number of words or characters in a selected text with this extension. Super handy! 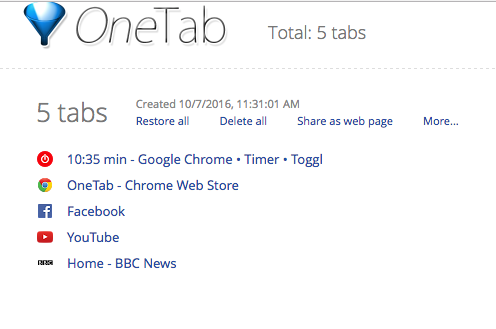 OneTab converts all your tabs into a list so you don’t feel overwhelmed with clutter. Bonus: Save up to 95% of your memory by reducing the number of tabs open in Chrome. Stay focused and install this extension that restricts your time on unproductive websites. Don’t worry, once the time you allotted is up, you can access the sites again! 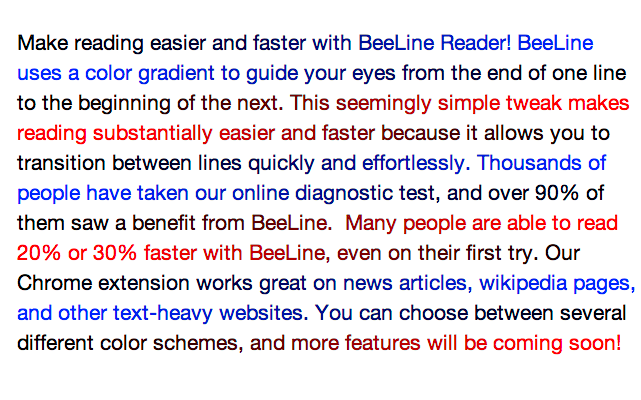 Beeline makes reading easy by changing each sentence a different color so that you know when one line ends and another begins. This extension makes writing as simple as possible; it’s just you and your words. No blogs, fonts, italics, etc. to distract you. Bonus: This tool has lots of cool features like automatically saving your work, working offline, and keeping track of your word count goals. Tired of typing out your email, name, website, and other information over and over? Auto Text lets you create custom shortcuts that automatically enter your information so that you can save on time, effort, and keystrokes. Bonus: This extension runs offline. Google Publisher makes it easy for you to view information on your Google ads, block unsuitable ads from your site, and see an account overview all from your browser. Too many articles and too little time? 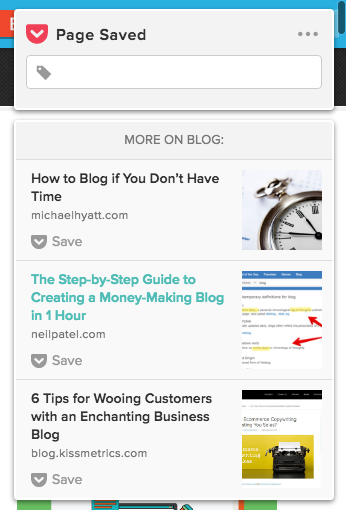 Pocket lets you save articles that you’re interested in reading later by putting them into your ‘pocket’. It also makes recommendations based on what’s in your pocket. Available for Android devices, too! Bonus: Download the Pocket Chrome App to be able to access your articles offline. Double Bonus: Pocket is integrated with Twitter, Google Reader, and Zite. Click here to get introduced to Pocket. EverNote is a great tool for researching and organizing your blogging topics. It lets you ‘clip’ entire websites, specific articles, and Gmail threads. Bonus: EverNote is integrated with Pocket so that articles you saved to read later can be easily transferred to EverNote. Click here to learn how to use EverNote. YAGBE saves your bookmarks in descending order (or in the form of a tree), helping you stay organized. This free password manager makes life easy for you by syncing all your passwords to one master password. It also gives you secure access from every computer and mobile device. Alternative: Another option is Autocomplete on, for those who prefer Chromes built-in password manager. The extension works by changing autocomplete=off to autocomplete=on on webpages so that all your passwords are saved to Chrome. For all you remote bloggers out there, this is a useful extension for knowing what time it is back home and what time it is on the beach. Protect your privacy by being able to add, edit and delete cookies right from your toolbar. Create lists and share them with your friends, family, and anyone else you want! Bonus: Wunderlist syncs your phone, tablet and computer so you have access to your lists from anywhere. Simply highlight and right click any text to translate it or, translate the entire page by clicking the translate icon underneath the tool bar. Bonus: You can change your settings so that every time you highlight a text it will automatically be translated. This extension provides access to ExpressVPN's services right on the Chrome browser, allowing users to circumvent geoblocks, encrypt their traffic and surf the web anonymously. Bonus: They have access to 148 VPN locations server locations and tests have proven they are one of the fastest VPN on the market. As the name suggests, with this extension you can make notes anywhere on any web page. Bonus: When you reload the page, the notes will still be there! Readability makes reading web pages easier by getting rid of clutter and saving it in a comfortable view. It also saves and organizes your reading content. With this extension you can read, receive, and reply to emails without a network connection. Save an entire webpage as an image by simply clicking on the icon in your browser or pressing Alt+Shift+P. This extension notifies you when one of your links is broken and is showing your viewers a 404 error. This extension lets you access blocked sites by configuring your browser to access proxy-servers without having to turn your proxy on and off. Keep track of the time spent on your browser with this extension that lets you add new tasks, name them, and view your time as you work. This extension provides you with data on the site you’re looking at while you look at it! Bonus: You can click on the icon to get more detailed stats. Access powerful SEO tools with MozBar. 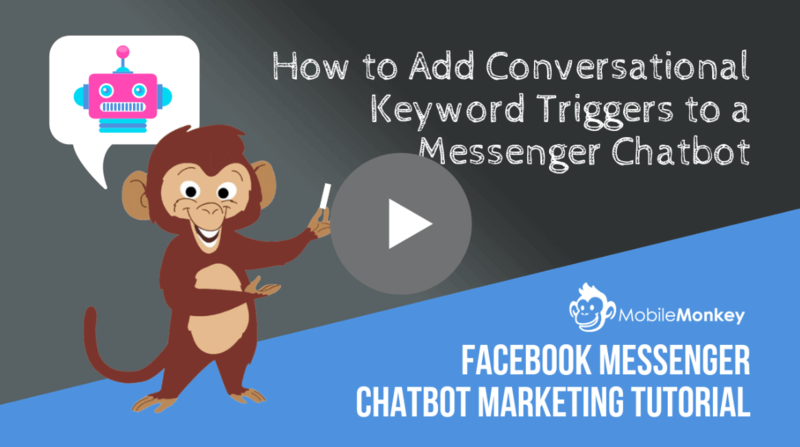 This extension lets you create custom searches, compare metrics, highlight links and keywords, see how difficult it is to rank for a given keyword, and much more. This SEO tool is the perfect combination of Alexa Traffic and MozBar. It provides information on backlinks, indexed pages, link stats and much more. Improve your SEO, reader engagement, your influence and your site traffic with this extension that recommends related images, links, articles, and tags for you to post on your blog. Just double click any word in an article and Google dictionary will define it for you. Bonus: You can save your definition history so that you can practice the terms later! Keep yourself current with Feedly, an online organizer for all your favorite news sources. Bonus: Also install Feedly Counter to see all the articles you have yet to read. Move your cursor over a thumbnail to view the image in full size without opening a new window. Bonus: Hover Zoom automatically resizes an image that doesn’t fit your window. For all you creatives out there, Wookmark lets you collect your favorite videos and images and create a board with them. Install this extension to get inspired! This extension lets you easily stumble upon interesting websites, photos, and videos. Customize your experience by filling in information on what kind of content you like and StumbleUpon will give you recommendations. This extension allows for quick and easy access to your WordPress blogs “Press This” feature. The “Press This” feature allows you to clip text images, and videos from other websites onto your blog. This extension helps you to manage your WordPress site by storing all your sites information and giving you easy access to your sites main pages. 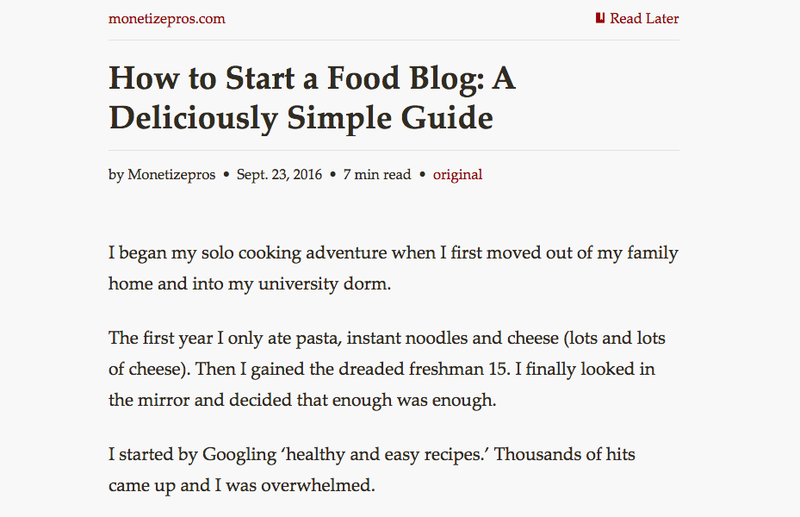 Every wonder where another blogger got that really cool feature? Well this extension lets you see all the technologies used on the site you are viewing. 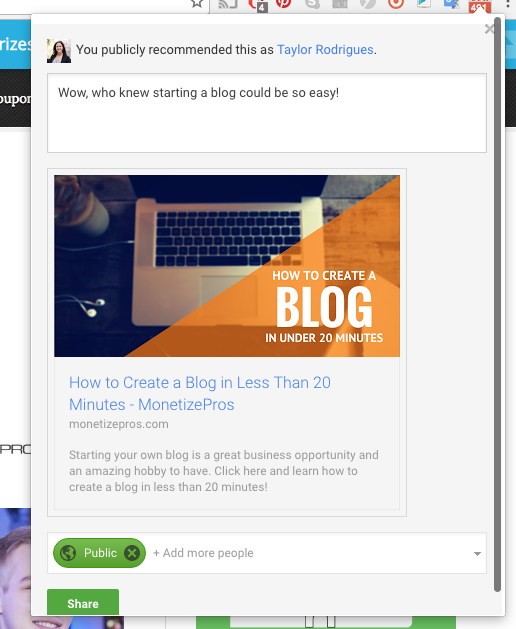 Quickly re-blog posts, queue posts, and like posts from your fellow bloggers sites. BlogLovin’ makes it easy for you to follow all your favorite blogs with one click of a button. 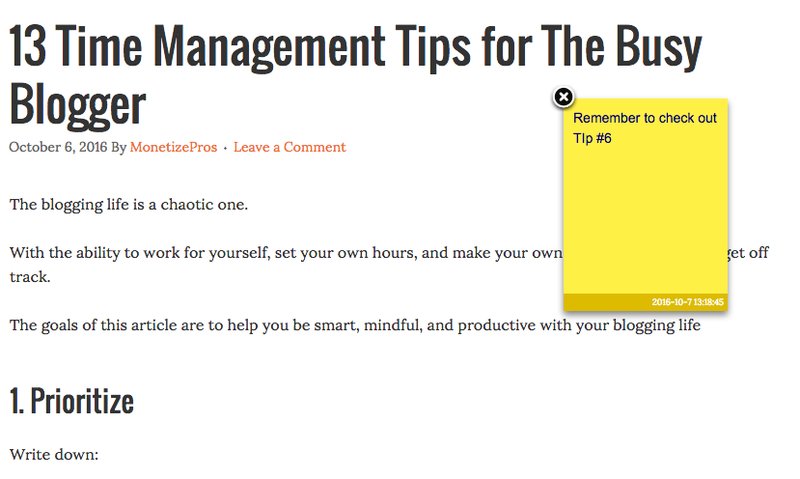 Bonus: This extension lets you know when there is an unread post from your favorite blogger. This extension lets you quickly overview your RSS and Atom feed in your toolbar. Headlinr generates perfect headlines for articles to help you optimize the number of people who click on your post. Which one's were your favorites? Would you add something? Leave a comment! 1) Like everyone said an Ad Blocker, I like ABP only because it was the first one I’ve used and never run into any issue. 2) Disconnect, it will block any Analytics, Advertisement, or Social features within a webpage. 3) I would change Pocket for Google Keep. My logic behind it, is if people are using chrome, they probably are using a google account. Google Keep is a note keeping, tracking and filtering made by Google. It can be accessed via Web, Android or iPhone and with the extension all it takes is a click and it will add your page as a note into it. Very helpful post! I’ve learnt a lot and almost 8 extensions personally used. Thanks for this guide. This step is learn which are blogger then they uses google chorme extension.Its very effective way to blogger.so this is the good content for all blogger.Thanks for nice sharing google chorme extensions.